WEDNESDAY, Dec. 20, 2017 (HealthDay News) — People who eat leafy green vegetables every day may maintain a sharper mind as they age, a new study suggests. The researchers found that, compared with people who rarely ate leafy greens, those who had at least one serving a day showed slower brain aging. It was as if they’d shaved 11 years off their age — as far as their brain function was concerned. “You can’t make that kind of conclusion based on studies like this,” said Keith Fargo, director of scientific programs and outreach for the Alzheimer’s Association. Rather, the study results suggest an association between the two. When it comes to food, leafy green vegetables — like spinach, kale and collard greens — have stood out from the pack, according to Martha Clare Morris, the lead researcher on the study. 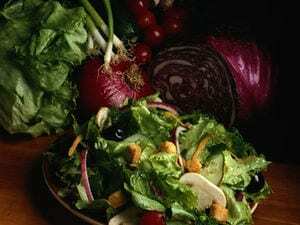 The investigators found that certain nutrients — including vitamin K, folate and lutein — seemed to largely account for the link between leafy greens and slower brain aging. Food provides a complex balance of nutrients that is not replicated in a pill, she explained. Plus, the array of foods in a person’s diet matters. For example, Morris said, some nutrients in leafy greens are better absorbed when eaten with fat — like an oil-based salad dressing. People in the top 20 percent for leafy green intake typically ate one serving a day. Morris said that’s just a cup of raw salad greens or a half-cup of cooked spinach, kale or collards, for example. “There’s a common misconception that raw vegetables are always better,” Morris noted. But when it comes to fat-soluble nutrients, like vitamin E and lutein, you’ll get more “bang for your buck” if the vegetables are cooked, she said. In a 2015 review of medical research, Fargo noted, the Alzheimer’s Association found good evidence that various lifestyle measures may help keep the aging brain healthy. The Alzheimer’s Association also pinpointed healthy eating habits. One example is the Mediterranean diet — high in vegetables, fish, whole grains and healthy unsaturated fat, and low in sweets, red meat and processed foods. Clinical trials testing the effects of diet and other lifestyle measures are already underway. Fargo said the Alzheimer’s Association is launching a U.S. trial, called POINTER, that will test a combination of approaches — including diet changes, exercise, and mental and social engagement. The Alzheimer’s Association has more on lifestyle and brain health.